A wonderful contemporary house in the very heart of St Davids with wifi. Gallery House offers you accommodation for 8 in four boutique style bedrooms. Gallery House was totally renovated in 2016.The original house dates back to the 18th century but now offers 21st century comforts and space. The house has been interior designed and has a feeling of tranquility and peace. 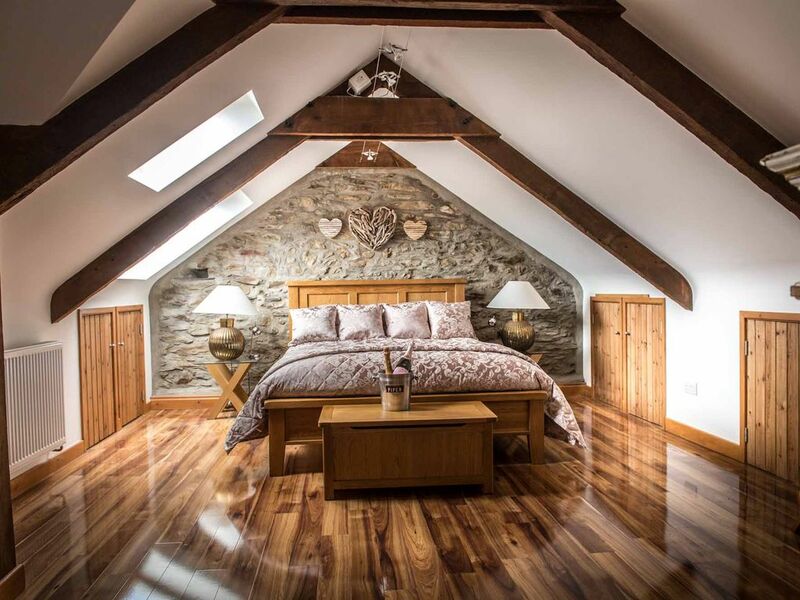 The 4 bedroomed pet free house has 2 twin bedded bedrooms,1 double bedroom and 'Love Loft' on the third floor accommodating king size bed and en suite.The first floor lounge has wonderful views of St Davids Cathedral and the distant countryside and coast. Gallery House is a pet free property. english, A small amount of Welsh! Jane and Nicholas live in St Davids with their 15 year old son,Toby.They have lived in Pembrokeshire for the past 8 years.Their working lives have been spent in the retail world and this is what they are about today owning a gift,gallery and framing boutique called Etcetera in the center of St Davids.Gallery House was conceived this year when the gallery expanded. Gallery house is set over three floors and offers contemporary boutique feel surroundings and yet feeling very relaxed to spend your time in.They were drawn to the property by its 18th century origins and its wonderful views of St Davids and the distant countryside and coast. The property offers a real living space over three floors.It has been totally renovated to accomodate 8 people in 4 bedrooms.It has a wonderful first floor lounge affording views towards St Davids Cathedral and the distant coast.A 'Love Loft' for two is on the third floor where you can lock yourselves away from your other guests! This also has impressive rooftop views from the upper reading landing and bedroom.A contempary en suite completes the 'Love Loft'. toilet, tub, shower, bidet, Relax in the big bath after a days walking! All bedding is of top quality. Public car park to the rear of Gallery House.Plenty of spaces and 2 car parking permits given for the car park on your arrival. Bathroom towels are provided but not for beach use! No way-you are on holiday! Plenty of coasts paths and waljs on your doorstep. Casual seating in the kitchen and living area. Pod coffee machine on top reading landing. dishwasher tablets,washing up liquid,cloths,tea towels and washing machine powder. Contempary kitchen with plenty of storage and built in fridge,freezer and dishwasher. Oak table for 8. 6 chairs and an oak bench. First floor lounge has a stereo system. A selection of books in the house. A small selection of cds. Gallery House ha s a stone laid terrace. A tandem can be hired at a cost of £20 a day! Boat trips for every taste -please see owners for advice. A stone terrace wth lovely views and seating for 8. All available in St Davids. Nearby St Davids Golf Club welcomes visitors. A few steps lead to the rear terrace and entrance-sorry. beautiful property, in a great location. Very central to all attractions in St Davids. Plenty to do in ST Davids, property is in the centre of the City and approx. 2miles from Whitesands beach. We had a lovely stay in St Davids with friends. Six of us - four adults, two teenagers. The location is wonderful and property was large enough for us all to find a space to relax and enjoy the festive period. We were very lucky with the weather and we were able to venture out for walks down to the cliffs and along the local beaches. The city is a real treat to visit and the atmosphere around Christmas was very special. Thanks very much Jane, Nick and Rachel. I wouldn't hesitate to recommend this property and look forward to visiting again soon. Stunning house, amazing welcome, cosy, warm, awesome views! The hosts were amazing, really friendly and helpful welcome, stunning goody pack too. Beautiful house, really well equipped cosy and warm on the cold and blustery days. Great location for exploring the local area - would definitely like to come back. The house is elegant yet homely with beautiful paintings on the walls. It’s like staying in an art gallery! Every detail has been thought of so your holiday starts the moment you walk through the door The owners are delightful and very responsive, we immediately felt at home. We thoroughly recommend staying at this property. A beautiful house combining the original features of some deep window ledges and exposed stone of the original thick-walls with all you could want in modern amenities and decor. It is not without reason that it is called Gallery House; as well as being behind and above the gallery run by the owners, it is itself adorned with many works of art. The contemporary furnishing is top quality and everything shows a flair for interior design. The bathrooms are luxurious and the kitchen is spacious and very well equipped. The first floor lounge, with its floor to ceiling window, faces west and offers a panoramic view, above the cathedral and bishop's palace in the foreground, across the countryside to the coast. Sit with a glass of what you fancy and watch the sun go down. The location in St Davids centre is ideal: quite but close to all that this tiny city has to offer and just half a mile or so to the Pembrokeshire Coastal Path, a spectacular location for any walking enthusiast (though not demanding in terms of gradients; you don't have to be super fit). Car parking is just yards away and free for visitors to the house. Blessed as we were with good weather, this was one of our best holidays ever to which the charm of the house was a considerable contribution. Thank you for such a lovely review. So glad you had a good holiday. The layout of the property was well thought out and made good use of the available space. Gallery house is an apt description with art on most walls. The owner was very helpful on arrival and if anything was needed he was in the art gallery adjoining the property. Overall a 5 star experience. We will definitely go again. St Davids is the smallest city in Britain on the tip of the west coast of Wales.It is surrounded by the most stunning coastline and is accessable by foot and road.